In light of recent volatility, we thought analyzing the risk of stocks would be a timely exercise. It would be wise to remember that ultimately, corporate profits drive stock prices and that profit levels currently indicate stocks are trading within their normal historical price range. Okay. That’s a lot to unpack. So let’s get started with it. The black lines in the graphic above shows the daily price history of the S&P 500 index since 1990 while the solid red lines represent the upper and lower bands of valuations placed on stocks. The gap between the two red lines shows the range stocks would’ve stayed in if they would have always been priced fairly. 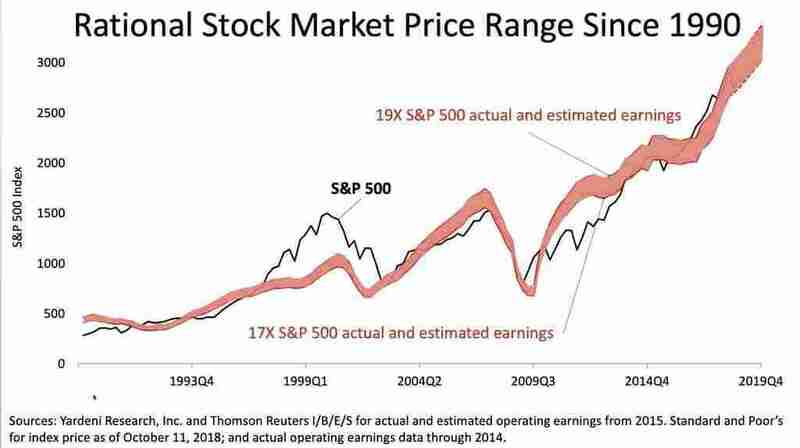 The upper red band of the price range shows the history of stocks had they been priced at 19 times their earnings for the previous 12 months while the lower red band shows the history of stocks had they been priced at 17 times their earnings for the previous 12 months. If investors always behave rationally when analyzing the risk of stocks, prices would never have strayed outside of the range. Of course, that’s not how the world works. See how stock prices soared here way above their normal range? That’s the tech bubble of 2000. Prices were irrational. Nothing like that is happening now. The dotted lines represent the latest forecast by Wall Street and list for earnings using the same 17 and 19 multiples. The current price of the S&P 500 following the recent drop is at the lower end of the historical range. For now at least, stocks are priced rationally. Please contact us with any questions or to set up a meeting, and don’t hesitate to share this video with people who might benefit from our work. The Evidence on the Evidence of Investing: How Do You Know What (and Whom) to Heed?